the 19th of September, 1846. We sincerely thank Mr. Joseph Corteville, President of the Association of the Children of Notre Dame of La Salette and of Saint Louis Marie Grignion of Montford+, and Director of L’Impartial+, a Marian revue, to have graciously supplied us with this manuscript and for authorizing us to publish same. It wasn’t long before Maximin broke the silence by bursting into laughter (I think he was making fun of me). I look at him and he says to me: “Let’s have some fun, let’s make up a game”. I said nothing in reply, for I was so ignorant I didn’t understand what games with other people were, always having been alone. I played with the flowers, on my own, and Maximin came right up close to me, doing nothing but laughing, telling me the flowers didn’t have ears to listen to me and that we should play together instead. While he was talking, I heard the bell of La Salette, it was the Angelus. I gestured to Maximin to lift his soul up to God. He took off his hat and was silent for a moment. Then I said: “Do you want to have dinner?” “Yes, he replied, let’s eat.” We sat down and I brought out of my bag the provisions my Master had given me. As was my habit, before breaking into my little round loaf, I made a cross with the point of my knife on the bread, and a little hole in the middle, saying: “If the devil’s in there, may he leave, and if the Good Lord is in there, may he stay!” and I rapidly covered up the little hole. Maximin burst into laughter and kicked the loaf out of my hands. It rolled down the mountainside and was lost from sight. I had another piece of bread which we shared. Afterwards, we played a game. Then, realizing that Maximin must still be hungry, I pointed out a place on the mountainside covered with all kinds of berries. I urged him to go and eat some and he went straight away. He ate a few berries and brought back his hat full of them. In the evening we walked back down the mountain together and promised to come back the next day and watch over our cows together. The Holy Virgin had a most pretty cross hanging round Her neck. This cross seemed golden, (I say golden rather than gold-plated, for I have sometimes seen objects which were golden with varying shades of gold, which had a much more beautiful effect on my eyes than simple gold-plate). On this shining, beautiful cross, there was a Christ; it was Our Lord on the Cross. Near both ends of the cross there was a hammer, and at the other end, a pair of tongs. The Christ was skin-colored, but He shone dazzlingly; and the light shone forth from His holy body seemed like brightly shining darts which pierced my heart with the desire to melt inside Him. At times, the Christ appeared to be dead. His head was bent forward and His body seemed to give way, as if about to fall, had He not been held back by the nails which held him to the Cross. I felt a deep compassion and would have liked to tell His unknown love to the whole world, and to let seep into mortal souls the most heartfelt love and gratitude towards a God who had no need whatsoever of us to be everything He is, was and always will be. And yet, O love that men cannot understand, He made Himself man, and wanted to die, yes, die, so as to better inscribe in our souls and in our memory, the passionate love He has for us! Oh, how wretched am I to find myself so poor in my expression of the love of our good Saviour for us! But, in another way, how happy we are to be able to feel more deeply that which we cannot express! 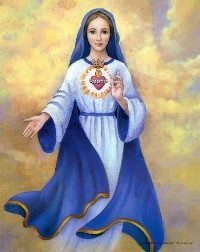 The Most Holy Virgin had two chains, one a little wider than the other. From the narrower one, hung the cross which I mentioned earlier. These chains (since they must be given the name of chains) were like rays of brightly shining glory, sparkling and dazzling. Her shoes (since they must be called shoes) were white, but a silvery brilliant white. There were roses around them. These roses were dazzlingly beautiful, and from the heart of each rose there shone forth a flame of very beautiful and pleasing light. On Her shoes there was a buckle of gold, not the gold of this earth, but rather the gold of paradise. Just the sight of the eyes of the purest of Virgins would have been enough to make the Heaven of a blessed creature, enough to fill the soul with the will of the Most High amid the events which occurs in the course of mortal life, enough to make the soul perform continual acts of praise, of thanksgiving, of atonement and expiation. Just this sight focuses the soul on God, and makes it like a living-death, looking upon all the things of this earth, even the things which seem the most serious, as nothing but children’s playthings. The soul would want to hear no one speaking unless they spoke of God, and of that which affects His Glory.